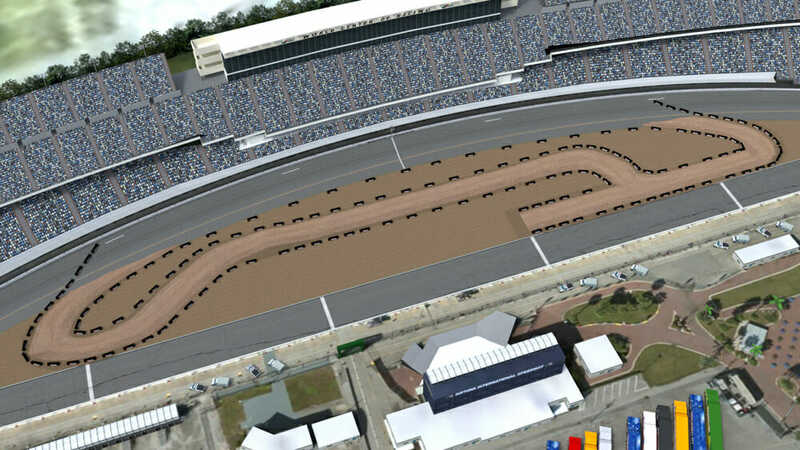 2019 Daytona TT race will use the start/finish straightaway of the Daytona International Speedway tri-oval as part of the racecourse. Daytona Beach, FL (February 5, 2019) – On March 14, 2019 at legendary Daytona International Speedway (DIS), American Flat Track will host what will arguably be the most unique and anticipated professional flat track race in history – the third annual Daytona TT. The hook is that the totally redesigned racetrack, constructed in the iconic Daytona International Speedway tri-oval, will utilize the legendary tri-oval start/finish asphalt straightaway as part of the actual racing surface, and form its high-speed front straight. Not only will some of the world’s fastest riders launch their AFT Twins presented by Vance & Hines and AFT Singles racing machines out of the DIS eastern dirt corner and drift onto the asphalt, they’ll rip across the legendary start-finish stripe at over 100 mph, elbow-to-elbow and wheel-to-wheel – and mere feet from fans sitting along the Daytona International Speedway tri-oval. In many ways, American Flat Track’s unique, dirt-and-asphalt Daytona TT season opener brings the sport of Grand National Championship motorcycle racing full-circle. Recall, of course, the legendary Daytona 200 beach-and-asphalt races of the ’30s, ’40s and ’50s, which featured motorcycles racing up the beach in a northern direction and then South again on the asphalt beach road, with untold thousands of fans watching it all unfold from the dunes and bleachers. The Daytona 200 eventually moved to the freshly-built Daytona International Speedway facility in the early 1960s (quickly becoming the world’s biggest and most anticipated motorcycle race), but those decades of epic beach racing have lodged themselves in the collective memories of the motorsports community ever since. Full circle, indeed. Since the reinvention of the series in 2017, American Flat Track has yet to present a multi-surface racetrack. The new, improved Daytona TT has been designed in collaboration and consultation with riders and race professionals to proactively address the design challenges inherit in the construction of an asphalt-to-dirt racing surface. Former professional flat track riders have been contracted to ride the surface and prove the design prior to the running of the race on March 14. This year’s track layout also features enlarged and faster bookend corners, which offer faster straightaway speeds and more passing opportunities – the perfect thing for fans sitting along the front straight or in the enlarged-for-2019 trackside bleachers. All of these changes combine to amplify the race’s Bigger, Better, Faster moniker to unheard-of levels. With new teams and riders, new sponsors and manufacturers, some fresh thinking and a tsunami-like wave of excitement and expectation, the 2019 American Flat Track season is bound to be the most exciting ever. And so it’s entirely fitting that this year’s unique Daytona TT, which features that unique mix of dirt and asphalt, and which pays homage to the visionary promoter who brought motorcycle racing to the sands and streets of Daytona Beach 82 years ago, leads things off in March. The history-making 2019 Daytona TT. Bigger, Better and much Faster! American Flat Track will kick off its 2019 season with its bar-banging Daytona TT in appropriate fashion – during the wild Bike Week festivities in Daytona Beach. The 2019 Daytona TT happens Thursday, March 14 once again under the lights of the iconic Daytona International Speedway. Tickets start at just $35 and are available now at https://tickets.americanflattrack.com.